Texas has also had 22 Zika cases in 2017, although local transmission has only been detected in Brownsville, a city on the Gulf Coast close to the Mexican border. It is highly probably for humans to get infected by contaminated water during natural calamities. Although it is not that big of a threat to many, the risk remains and there are casualties even if just a handful. Mosquitoes are known vectors of disease-carrying germs and they love to stay and breed in stagnant water – pretty much what the rest of Texas looks like right now after being ravaged by the recent hurricane. Then, temporary shelters aren’t always the most comfortable of places although they give you the peace of mind that you are out of imminent danger. Many end up sick in such crowded conditions where facilities aren’t always the cleanest. Flood water – a nasty cocktail of chemicals, heavy metals, sewage, debris and wildlife – was still pouring into people’s homes on Tuesday. Social media overflowed with images of people being rescued via jet ski, canoe and fishing boat. 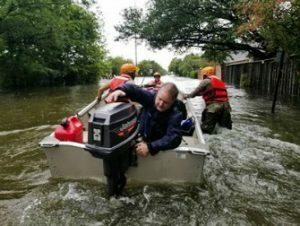 Twelve hospitals in the Houston area were evacuated by Tuesday. Some emergency medical services were coming back online in Corpus Christi and Victoria. “Aside from just the general public health functions, we also help coordinate medical transportation, assisting and coordinating and evacuating hospitals,” said Van Deusen. “We have been moving ambulances, ambulance buses, and we’re staging some helicopters,” he said. Public officials are taking these efforts seriously just as much as they do on relief and rehabilitation initiatives because human life always comes first. Water may be life but it can also mean death to some unfortunate citizens of Texas who have been living under floodwaters for days now. Aside from the immediate risks you get from exposure to floodwater, going back to homes that have been flooded has become a breeding ground for mold that is a serious health risk as well. In a humid state like Texas, it can mean a rise in lung-related conditions like asthma attacks. It will also take time before homes are cleared of floodwater and become healthy living spaces once more. The storm may have passed but the suffering lives on and continues to test mankind’s resiliency to the wrath of nature.